According to me, the answer is B as the tertiary allylic carbocation should be more stable. But the answer given is D and in the given solution, the tertiary allylic carbocation rearranges to primary allylic carbocation to yield Option D.
My question is why does rearrangement from tertiary allylic carbocation to primary allylic carbocation take place? Not the answer you're looking for? 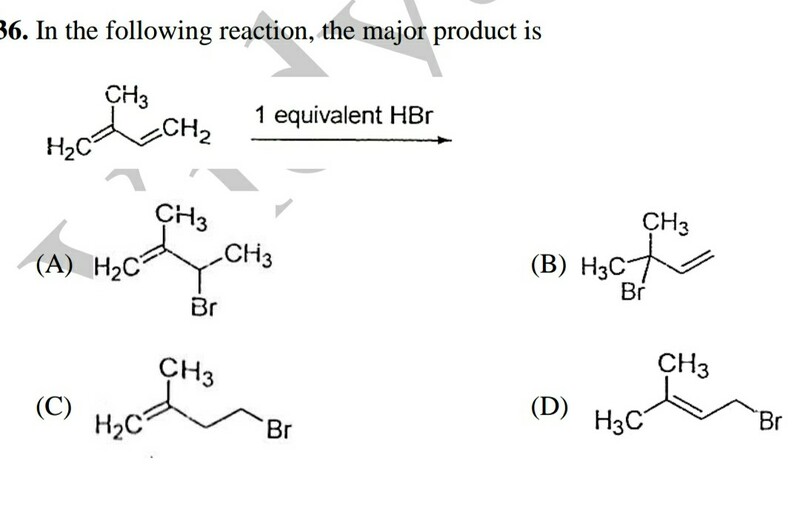 Browse other questions tagged organic-chemistry reaction-mechanism c-x-addition or ask your own question. Is an SN1 mechanism feasible with allylic or benzylic halides as substrates? Hydrolysis of 4-chloro-3,3-dimethylbut-1-ene forms which products much faster than primary alkyl halides? Are allylic three degree alcohols oxidized by the Jones' reagent via a classical carbocation intermediate? Why do vinylic carbocations generally not undergo hydride rearrangement from neighbouring sp3 carbon to get more stability?